Welcome to the Poison Dragonknight Build PvE “Infection” for Elder Scrolls Online. This build is part of the Sheogorath’s Corner, therefore it uses very specific themed sets and is here to bring fun and entertaining gameplay! If you want a more maximized dps setup I recommend checking out my Stamina Dragonknight “Venom” Endgame Trials & Dungeon Build. This Setup features specific poison sets in combination with Dragonknight poison abilities. We are using the Viper's Sting set that deals poison damage over time and can be found in Fungual Grotto, the Plague Slinger Set which deals poison damage and can be found in Scalecaller Peak and also the monster set Spawn of Mephala, which deals poison damage over time and drops in Fungual Grotto 2. As a last set we are using an ability altering weapon called The Master's Bow, which drops in Dragonstar Arena veteran, which is only an addition and not necessarily required for the build to function. The five piece sets can be acquired in normal or veteran and the monster set & Master’s Bow has to be acquired in veteran mode. Now keep in mind, If you want to gold out the weapons I do recommend using the set Night Mothers Gaze instead of Viper, as Night Mothers Gaze is used in most end game setups so it will be more beneficial if you want to swap over to a more maximized damage setup! The Viper's Sting five piece bonus is: “When you deal damage with a melee attack, you deal an additional 6400 Poison Damage over 4 seconds. This effect can occur once every 4 seconds”. This set will place a constant poison damage over time effect on the enemy that gets refreshed the moment it runs out. 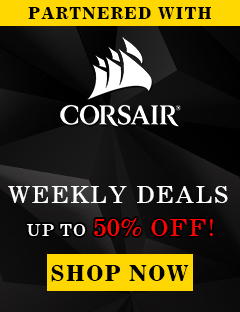 You are required to deal melee damage which is not a problem at all for a melee based build. The Plague Slinger five piece bonus is: “When you take damage, summon a Skeever corpse which will launch a poison ball that deals 5160 Poison Damage every 1.5 seconds at the nearest enemy for 6 seconds. This effect can occur once every 15 seconds”. This set is also very easy to activate, all you need is take a bit of damage and the poison ball will activate. Keep in mind that this set is stationary, so once the enemy moves out of the marked area the set will not deal damge anymore. The The Master's Bow increases your weapon damage by 301 against targets affected by your Poison Arrow. You have to make sure that the Poison Injection hits the target before you weapo swap, otherwise you will not gain the extra weapon damage. The weapon damage will also not show on your character sheet, but will increase the damage of your abilities. The Spawn of Mephala monster set does: “When you deal damage with a fully-charged Heavy Attack, you create a web for 10 seconds that deals 1100 Poison Damage every 1 second to all enemies within 4 meters and reduces their Movement Speed by 50%. This effect can occur once every 10 seconds”. We are using heavy attacks on the frontbar, so it will always proc on cooldown. Keep in mind, this is a stationary effect on the ground, so if the enemy moves out of it he will not take damage anymore. The Night Mother's Gaze set five piece bonus is: “When you deal Critical Damage, you reduce the enemy’s Physical Resistance by 2580 for 6 seconds”. This debuff works for the whole group, so your buddies will also deal increased damage. The set is very easy to proc as it only requires a critical strike from any source. The set lasts for 6 seconds, so even if you swap to the backbar you will manage to keep it up for quite a while. The only really important tool to get good sustain is heavy attacks for this build. They restore a huge amount of stamina and are built into your rotation. It also helps if you are a Redguard as they are the best race in terms of overall sustain! If you think you still struggle then I recommend using either a cost reduction or recovery glyph, in this case a cost reduction glyph will be better as we have pretty overall low stamina recovery. 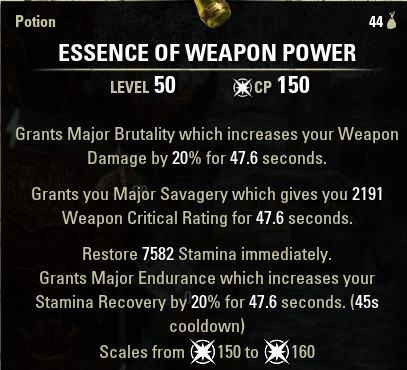 Weapon Power Potion and Weapon Damage Enchantment were active when I took this screenshot. I am using an Outfit here. Note: Stats might slightly differ because of balance changes from ZOS. Master’s Bow: I do recommend trying to get the Master (or Maelstrom) Bow for this build, as it will increase your damage by a lot. Dragon Star Arena veteran is fun, make sure to give it a go! Viper’s Sting Daggers: There is an unique drop in Fungual Grotto 2 from the Gamyne Bandu Boss (2nd Boss) that drops a Viper’s Sting sharpened Dagger that you can use for this build. The name is “Knife of Shadows”. This setup here is easier to get as you can simply craft the weapons, because Night Mother’s Gaze is a craftable set. The extra penetration will also increase your overall damage of your abilities and damage sets, that is why we have chosen Night Mother’s Gaze. Where can I get the gear? Vigor & Caltrops: I do recommend going to Cyrodiil and aquire those two specific skills as they are quite important for most builds. 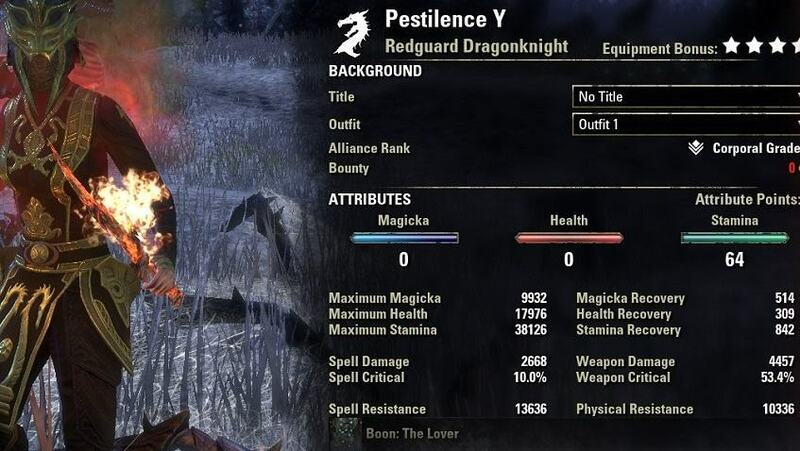 If you are unexperienced in PvP I recommend joining a group in Cyrodiil and then you will be able to aquire those two skills very fast. 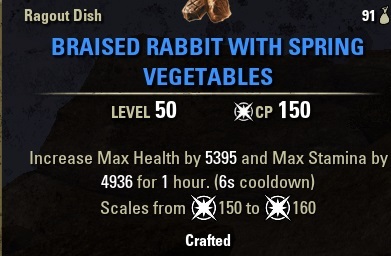 We are using the standard max health an max stamina buff-food which can be crafted or aquired through Guildstore. With this setup we are using the Lover Mundus Stone to increase damage both for our skills and sets through increased physical penetration. I do recommend using weapon crit potions with this setup. However, if you would like to only run the normal stamina potions, then you need to make a few adjustments. Instead of Molten Armaments make sure to run Igneous Weapons, because that skill will provide you with the weapon damage buff (which you would get from the Weapon crit potions). This build has a lot of damage over time effects, it might be quite tricky to keep them all up at the start. Always weave one heavy attack between every skill on the frontbar and use light attacks on the backbar. Make sure to share this with your friends. 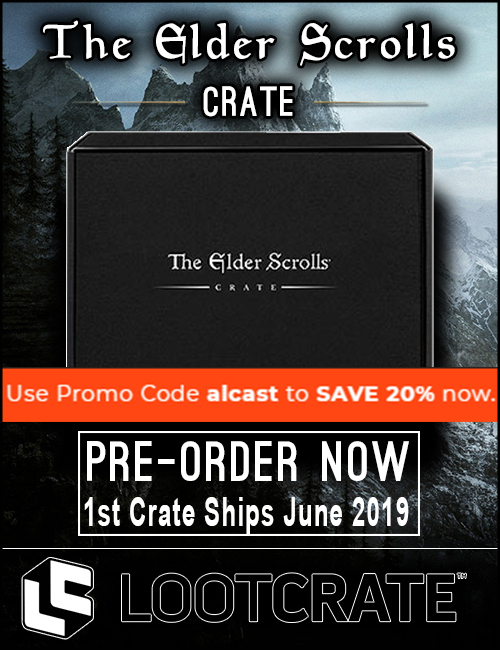 Elder Scrolls Crate – Loot Crate Promotion!